Dianne has a love of fabric and sewing that began as young girl when her mother taught her to make doll clothes, then on to sewing all her clothing . She learned all other needle crafts quickly. She went on to college to earn a Bachelor of Science Degree in Home Economics/ Textiles & Clothing at California State University, Chico, in 1973. Shortly afterwards, she picked up a book, taught herself piecework and quilting, and made her first quilt. Her passion for designing by piecing expanded. Teaching herself machine applique followed, and she started designing and selling appliqued backpacks and wall hangings. Later she sold her backpack design to a pattern company with national distribution. She started “Fabrications” in 1990, in Bend, Oregon, custom sewing for interiors of homes. Working with interior designers and the amazing fabrics being used, opened up her creative mind for using designer fabrics in quilts. These unique fabrics of high quality have become the mainstay in her art. To present, she has designed and created over 35 original designs of arts quilts. In July of 2011, she had her first showing of her collection, as a special show at the Sister’s Outdoor Quilt Show. Later that year she joined Studio Art Quilt Associates, and has since been active in the local group of quilt artists. 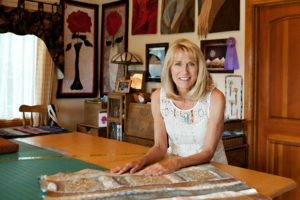 She is also involved with a small mentoring/critique group called Sundance Art Quilters in Bend, where they create new challenges in fabric art. Most recently, in 2014, she had her first art quilt accepted by a jury in a SAQA show called “Food for Thought”, with her piece called “Just Peachy”. It is currently on tour for three years. Then in early 2015, her second piece “Moondance” was accepted in a regional SAQA show called “Blending Poetry and Cloth”, which will be on tour for 2 years. Living in Bend, Oregon since 1978 with her husband, they are active outdoor sports lovers, where skiing, golfing, hiking and mt. biking fill their free time. She loves living near the mountains and nature, and feels lucky to be in a premier quilting community that is active and strongly supported.